September 3 1781 at “Ridgeway’s Fort”,South Carolina.Americans commanded by Captain John Ridgeway[my 5th great grandfather]-forceskilled .wounded[-] captured[-]. Conclusion: British victory. On September 3 1781 Major “Bloody Bill” Cunningham crossed the Saluda River to raid Ridgeway’s Fort.The Fort was one of two blockhouses on the Reedy River the patriot militia had built to protect the frontier settlements from the raids of the loyalists and Indians.Captain John Ridgeway garrisoned one of the blockhouses with 30 men of the Little River regiment.After the death of Ridgeway and 9 others the remaining patriots surrendered the Blockhouse to Cunningham. 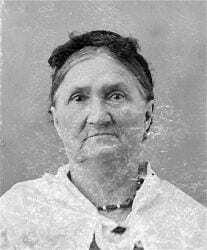 Mary Polly Ann Mullican Black is my third Great Aunt.She is a sister to my great great Grandmother Elizabeth Mullican Morgan.She is the daughter of Solomon Mullican and Nancy Ridgeway Mullican.She was born in 1822 in Kentucky and died in 1902 in Linn Co,Kansas.She married Moses Black Jr in 1844.They migrated to Linn Co,Kansas by wagon train in 1868.They had the following children 1 Dr John Simpson Black born in 1845 and died in 1930. 2 Nancy Catherine Black born in 1847 and died in1871 3 Mary E. Black born in 1849 and died in1868. 4 Elizabeth Jane Black born in 1852 and died in 1929. 5 Siltira Black born in 1852 and died in 1927. 6 Hilda S. Black born in 1857 no deathdate. 7 William Grant Black born in 1857 and died in 1880. 8 Magdalena Black born in 1867 and died in 1936.